For @sanctuary’s High Fashion Design Contest. 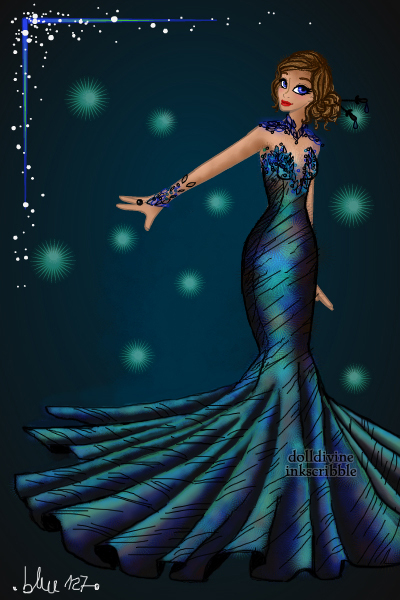 Wow, the way you did the coloring on the dress is fantastic! It looks iridescent and 3D! Im so in love! Congratulations! You won 1st place in my High Fashion Design Contest #2: Labradorite! You will receive 100 crowns and 3 comments. What can I say. Your dolls are always stunning and so so gorgeous. I love the shape of the dress and the beautiful colors and the way you blended them together. The black lines are nice details and a adore the neckline of the dress and the neck- and armpiece. And as always I love the hairstyle. So pretty! I still am confused, therefore, I'll just withdraw my entry although I don't agree. I have no idea what other course to take. Lovely effect you created there. You spoil us with your high quality dolls blue! Oh! My! Wow! This is beyond sublime!!! I can't tell you how much I adore labradorite, or this dress!!! What a beautiful dress!! The colour combo is fantastic! !